Alexander G. Domenicucci, of Maddin, Hauser, Roth & Heller, PC, has been elected vice chair of the taxation section of the State Bar of Michigan and also has been appointed chair of the tax committee of the Oakland County Bar Association. In his role as vice chair, Domenicucci will lead tax practitioners and educate the public to help achieve an equitable, efficient, and workable tax system. As chair of Oakland’s tax committee, he will lead monthly meetings discussing current developments in federal and state tax law, and lead efforts to educate members of the organization in that area. As a shareholder of the firm, Domenicucci specializes in the areas of federal and state taxation, counseling businesses and individuals on a wide range of transactional, planning, and controversy matters. 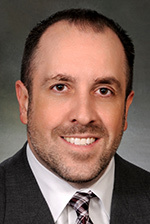 Domenicucci, of Clinton Township, is a graduate of Wayne State University Law School, where he served as editor-in-chief of The Wayne Law Review.